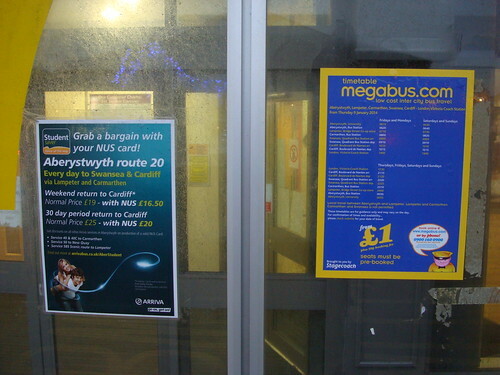 December 21st (2013) was the end of an era for bus services in Ceredigion. The following is my travel report on the day. Soon after 6pm I arrived at Aberystwyth station to catch the final 18:15 Aberystwyth to Cardigan X50 service. Departure Time, YJ55BKE stands ready at Aberystwyth with the final 18:15 X50 service to Cardigan. I thought it rather fitting that the vehicle used was YJ55BKE, one of the two Tempos ordered and route-branded for the X50 service. I think this is only the second time I have seen an X50 vehicle on this service (the timetable means the two buses were not sufficent to cover both this working and the two evening full-length 550 runs, so other vehicles have had to substitute). I took this service as far as Aberaeron, passing the Arriva Pulsars on the final northbound 50 service and the penultimate northbound 40 service. At Aberaeron I alighted to await the final CymruExpress 40 service to Aberystwyth. Merry Christmas? 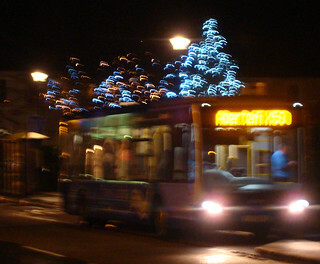 The final evening X50 service to Cardigan, with Aberaeron’s christmas lights in the background. YJ55BKN, once an Arriva-liveried Tempo on the TrawsCambria 550 and X40 but now part of Richards Bro’s fleet, passed on the 17:36 Cardigan to Aberystwyth 550 service (which due to regulations on service length now changes to X50 at Aberaeron). 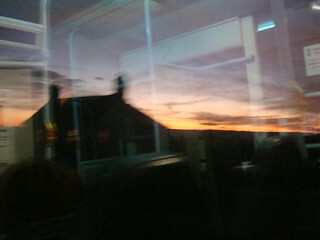 Perhaps this distracted me enough to miss Arriva’s final CymruExpress 50 service, the 18:15 from Aberystwyth. Either way, I did not see that service so I wonder if Arriva failed to run the final 50 service. 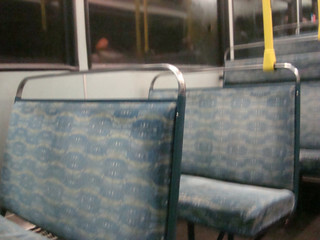 While I was waiting, one of the Arriva Pulsars came up from the New Quay direction running Out Of Service. Since it wasn’t stopping I only had time to catch part of the number plate. What I meant was, it’s a shame the bus depot in Aberystwyth is closing, and it’s a shame some of the staff Arriva have made redundant may be unable to find alternative employment. However, I’m not sorry at all that Arriva have left the area, their policies have been obstructive in the aims of providing a good overall public transport service and at times they have displayed incompetence. I stress that I attribute these problems to the distant management, the local staff are probably completely blameless and had they been employed by the local independent operators instead of Arriva I’m sure we wouldn’t have had these problems. At Aberystwyth, after taking some photos of the last 40 at the station, I quickly dashed over to the Arriva depot to see if I could photograph the fleet. It was however too dark and the photographs didn’t come out well enough. 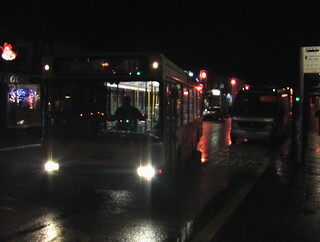 Then it was time for a lift home by car, passing ex-Arriva (now Richards Bros) Optare Tempo YJ06YRZ (heading into Aberystwyth on the final 550 service) as we left the town. 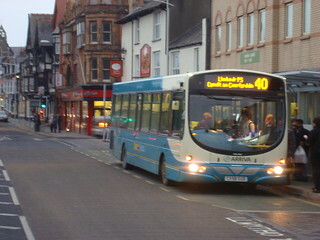 Departures: an Arriva CymruExpress 40 service at Aberystwyth bus station. 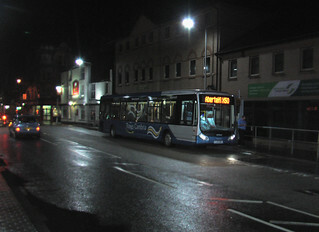 The 585 service in the background will continue until February and be Arriva’s last Aberystwyth service. Rejoice! CymruExpress is dead. 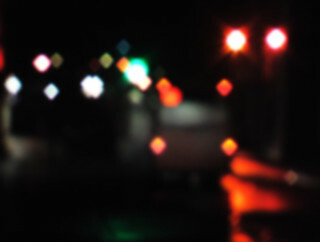 Right now (21:18 on December 21st 2013), the CymruExpress 20 service should be pulling into Aberystwyth, marking the end of Arriva’s obstructive CymruExpress operation in Ceredigion and Carmarthenshire. Some time ago, on my now extinct previous blog, I wrote a post titled ‘Arriva Orders Flying Buses’. 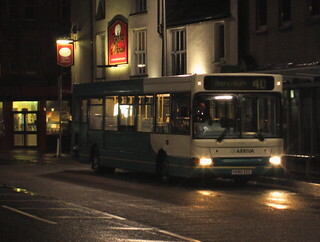 The story was that Arriva Buses Wales published a timetable for new services out of Aberystwyth, branded CymruExpress, which commenced operation on February 26th 2012. 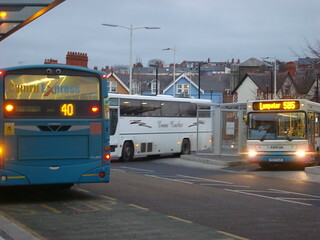 These services replaced the former TrawsCambria 550 (Aberystwyth – Aberaeron – New Quay – Synod Inn) and TrawsCambria X40 (Aberystwyth – Aberaeron – Lampeter – Pencader – Carmarthen) services. As the brand name suggested, the new services known as 50 (replacing the 550) and 40 (replacing X40) were timetabled faster than their predecessors. The 50 was timetable 8 minutes faster than the 550 northbound (3 minutes faster southbound). The futility of this timetable is perhaps illustrated by the fact today’s (December 2013) 50 service is timetabled to do the northbound trip only 1 minute faster than the old 550. Arriva CymruExpress. Going… Going… Gone! The real motivation for my ‘flying buses’ tag however was the 40 service. Whereas the old X40 service had been timetabled to do the journey to Carmarthen in over 2hrs 20mins, the 40 was timetabled to take a blistering 1hr 55mins. This included an allowance of just two minutes between Carmarthen’s bus and rail stations, something that I believe would only be achievable on a regular basis if you could fly across the river. To be fair, the 40 does take a more direct route than the X40, but even so northbound buses were frequently over five minutes late by the time they reached Aberaeron. This meant passengers off the services from Cardigan, who were supposed to have a connection into the 40 to Aberystwyth, had a very long wait on Aberaeron’s cold, cigarette smoky, bus stop. Again, Arriva have been forced to back track, the southbound service now runs direct to the rail station in Carmarthen, with the bus station only served northbound. The northbound journey time is now a much more realistic 2hrs 10mins, although it still isn’t quite reliable. I’d say it should be 2hrs 15mins, and sure enough the service contracted to replace the 40 from Monday to fill the void left by Arriva is timed at 2hrs 14mins. So, one cause for celebration is that services should be more punctual following Arriva’s departure. Furthermore, Arriva launched CymruExpress commercially while the Welsh Government and local councils were out to tender for a new TrawsCymru service, the TC1, to replace the X40. That would have brought six new buses and a 6am to 8pm service to the corridor, but had to be abandoned due to Arriva’s commercial actions. This ripped a gaping hole in the TrawsCambria/TrawsCymru network, removing a core route. While the six new buses have been diverted to other TrawsCymru routes, Arriva’s departure offers hope that TrawsCymru will now be able to return to the corridor in future. End Of The Line: The very last Arriva 40 service arrives in Aberystwyth. Additionally, those ‘connections’ in Aberaeron to get you from Cardigan to Aberystwyth, which Arriva held a strong disregard for (with frequent timetable changes breaking the connection), will be a thing of the past from Monday. Richards Bros will be running a service replacing Arriva’s 50, which will be extended through to Cardigan as part of Richards existing 550 service. So, great news all round then, apart from the Arriva drivers who will lose they jobs as a result of Arriva leaving Aberystwyth? Well, not quite. I hope to explain on Monday. Today (Saturday December 21st 2013), Arriva Buses Wales will withdraw most of their services in the Aberystwyth area. This includes the 20 to Cardiff, which is supposed to be a coach. It departs early in the morning, returning in the evening. Adverts for the Cardiff route. Now though, another poster has appeared. Stagecoach will operate a service to London on selected days of the week, starting on Thursday 9th January 2014. This will also depart early in the morning, with the return service arriving so late in the evening that it’s actually early next morning. Like the Y Gerallt Gymro (Gerald for short) premier train service from Holyhead to Cardiff this service is only available for return trips in one direction. There are no mirror workings (from Cardiff to Holyhead/Aberystwyth in the morning and heading to Cardiff in the evening). Unlike ‘Gerald’ however, the coach service will run at weekends. When this post is published, at 18:05 on 15th December 2013, the Arriva 40 service should arrive into Aberystwyth bus station, assuming it is on time. If I am correct, this will be the very last Sunday bus service in Ceredigion. Next Sunday, the only public transport in the county will be the rail line north from Aberystwyth and a single journey each way on the 701 coach service to Cardiff. Please comment to correct me if I’m wrong, but I do think there are no other Sunday buses in Ceredigion. Well, it has been a while since the the database underlying my previous blog was deleted. Time to get back in the game, and this time the title reflects the site’s public transport focus.